EXECUTIVE SUMMARY: In a far-reaching development for India’s strategic interests, Russia signed an agreement with Pakistan for naval cooperation on July 31. The agreement comes on the heels of an accord between Moscow and Islamabad in April of this year to increase cooperation in the training of armed forces personnel in the naval field and the conduct of a wide range of joint military exercises. Russia is building military, diplomatic, and economic ties with Pakistan that could upend historic alliances in the South Asian region. Ties between India and Russia date back to the Cold War, but relations between Cold War adversaries Russia and Pakistan are now being developed on the basis of a convergence of interests. With Washington suspending or curtailing military aid to Pakistan, collaboration with Moscow is going to be pivotal for Islamabad. Russia has long been India’s strategic ally, so New Delhi is concerned about Moscow’s developing relationship with Islamabad. It is particularly worried about their ties in the defense realm as most of India’s military equipment is of Russian origin. The warming of Russia-Pakistan ties is a relatively recent phenomenon. A tilt in Russian foreign policy towards Pakistan has been visible for some time, with Moscow making concerted efforts to build strong ties with Islamabad. The primary focus of the nascent diplomatic ties has been Afghanistan. Russia has cultivated ties to the Afghan Taliban, who have historic links to Pakistan. Islamabad is recognized by the Kremlin as a vital ally in the peaceful settlement of the Afghan conflict. Moscow’s embrace of Pakistan comes at a time when ties between Washington and Islamabad are unravelling over the war in Afghanistan. This is a remarkable turnaround from the time when Pakistan helped funnel weapons and spies across the Durand Line to aid mujahedeen who were battling Soviet troops. The Soviet invasion of Afghanistan, Pakistan’s Islamization under President Zia-ul Haq, and military support to the Afghan jihad had widened the gap between Moscow and Islamabad. Moreover, the Pakistani regime of General Zia was labeled by the Reagan administration as the “front line” ally of the US in the fight against Communism. Even after Moscow overcame its bitterness following the withdrawal of Soviet forces from Afghanistan, Russia’s ties with Pakistan remained low-key. After the disintegration of the USSR, Russian-Pakistani relations continued to be defined by Moscow’s traditionally close ties with New Delhi. However, Pakistan has emerged as the elephant in the room when it comes to India-Russia relations. Though the Russia-Pakistan rapprochement is in its formative stages, and it is China that is filling the growing void left by the US in Pakistan, a growing military cooperation promises to spark life into the newly formed relationship. 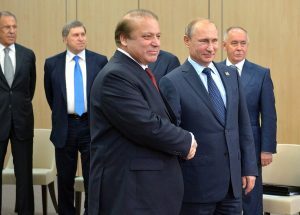 While Moscow’s relations with New Delhi are the product of a long evolution, its ties with Islamabad mark a sea change. The two countries never had much depth to their ties, barring some high-profile visits. However, Russia’s landmark decision in 2014 to lift its arms embargo against Pakistan changed all this. It was done to sell military helicopters to Pakistan, followed by other systems. During the first visit of a Russian defense minister to Pakistan in November 2014, the countries signed a military cooperation agreement. In June 2015, Pakistan’s then army chief, Gen. Raheel Sharif, visited Russia and met top Russian leadership. A deal for the purchase of Mi-35M assault helicopters was signed in August 2015, and Pakistan received four helicopters in August 2017. The first Russia-Pakistan counter-narcotics exercise was held in October 2014, followed by a second in December 2015. Moscow’s overtures to Islamabad give nuclear-armed Pakistan a critical diplomatic lifeline as it faces growing friction with the US over links to Islamist terrorists. At the same time, Pakistan provides a potential market for Russian weapons. This is a huge incentive for Moscow, as the Russian economy is heavily dependent on arms exports. The amount of Russian military equipment supplied to Pakistan is still very small, and Islamabad does not have the financial wherewithal to make big-ticket purchases from Moscow. But given the obsessive anti-India strand in Pakistan’s strategic culture, Islamabad’s military establishment can be expected to indulge in economic adventurism. Pakistan has already expressed its desire to acquire T-90 tanks from Russia as part of a long-term deal. Moscow argues that its ties and assistance to Islamabad are aimed at bolstering Pakistan’s counter-terrorism capabilities. Ironically, the Financial Action Task Force (FATF), a global financial watchdog, recently put Pakistan back on its “grey list” for failing to curb anti-terror financing. There are no grounds to believe the Imran Khan regime will represent an improvement. Russia and Pakistan continue to work closely in Afghanistan to challenge the US, and this effectively translates into supporting the Afghan Taliban with greater vigor. Both countries claim to be alarmed by the presence of Islamic State (IS) inside Afghanistan, with Moscow troubled by the fact that IS fighters could spread towards central Asia. The IS calls its Afghan branch the “Khorasan Province,” or ISKP, and routinely carries out suicide bombings in Afghanistan. On July 11, the intelligence agencies of Russia, China, Iran, and Pakistan held an important meeting in Islamabad to formulate “coordinated steps to prevent the trickling of IS terrorists from Syria and Iraq to Afghanistan, where from they would pose risks for neighboring countries.” But disturbingly, neither Afghanistan nor India was part of this discussion. Ideally, the meeting should have happened under the aegis of the Regional Anti-terrorism Structure (RATS) of the Shanghai Cooperation Organization (SCO), as all affected countries are either its members or observers. The non-involvement of the SCO exposed its limits in countering terrorism. Clearly, Russia’s role in Afghanistan is increasingly in opposition with what India believes. Longer-term perspectives, rationality, and diligence are required for policies to develop some direction and momentum as far as Indo-Russian ties are concerned. If Moscow feels that New Delhi should take steps to correct the contradictions and imbalances in their bilateral ties, it cannot avoid its own responsibility in breaking the impasse. Jeopardizing Indian interests by emboldening Pakistan’s recklessly ambitious military establishment is not the best way forward. Vinay Kaura is Assistant Professor of International Affairs and Security Studies and Coordinator of the Center for Peace and Conflict Studies at Sardar Patel University of Police, Security and Criminal Justice in Rajasthan, India.